A rarity occurred last week in mixed martial arts — there were no major fight cards. But just because no one put their hands on someone’s face or tried to make their opponent scream in agony on the mat for them to release a submission, that doesn’t mean nothing went on. Here were the high and lows of the last week in MMA. The champ-champ pulling double duty? UFC light heavyweight and heavyweight titleholder Daniel Cormier told Sporting News at his UFC 230 media day to promote the defense of the latter belt against Derrick Lewis that he had to postpone a scheduled a commentary tryout with WWE. A Fox Sports source told SN they requested Cormier to the pro wrestling giant since Fox will be airing Smackdown on Friday nights starting October 2019. The source also said the broadcasting giant wants the show to be presented as a real sport, and adding someone with the legitimacy of Cormier would make it feel that way. If Cormier gets the gig, he would still be doing his commentary duties with the UFC. Cormier, who will retire on his 40th birthday March 20, is a lifelong wrestling fan and even had a WWE tryout to be a wrestler back in 2004.
Who knows how the audition goes down, but for a company always looking for mainstream acceptance, they couldn’t find anyone better. Lightweight great gets paid. The MMA world received a huge surprise when Asian promotion company One Championship announced the signing of former UFC and Bellator lightweight champion Eddie Alvarez to a multi-fight deal. While the 34-year-old received offers from the two major organizations in the MMA landscape, the “eight-figure offer” that came his way by One ended up being too good to pass up. What a pleasure and honor having @Ealvarezfight in studio yesterday to talk about his new “8-figure” deal with @ONEChampionship. Here’s more on what appears to be one of the best contracts in MMA. You can never begrudge anyone for leaving a company to go to another one for greener pastures. Especially fighters. They put their lives on the line every time they enter the cage and deserve to be fairly compensated. Instead, they are among the lowest paid in all sports even though promotions rake in millions upon millions of dollars a year. Every fighter should test free agency. That’s why it’s called an open market. Fighters will only know their true value by having conversations with other organizations. That’s how you get the maximum by having companies bid against each other. Not enough fighters do that and are content with the status quo. The shelf life for fighters isn’t very long and only a handful make life changing money. It’s extremely rare for an organization to give you top dollar right out of the shoot. They have budgets and want everything on the cheap. Can’t blame them for having that mindset. You have to literally fight for every dollar. Alvarez is the only fighter to win a UFC and Bellator title. He’s regarded by many in the sport as the greatest 155-pound fighter of all time. It is well deserved that he gets rewarded for the last 15 years of blood, sweat and tears that he’s put into the sport. A comical superfight. 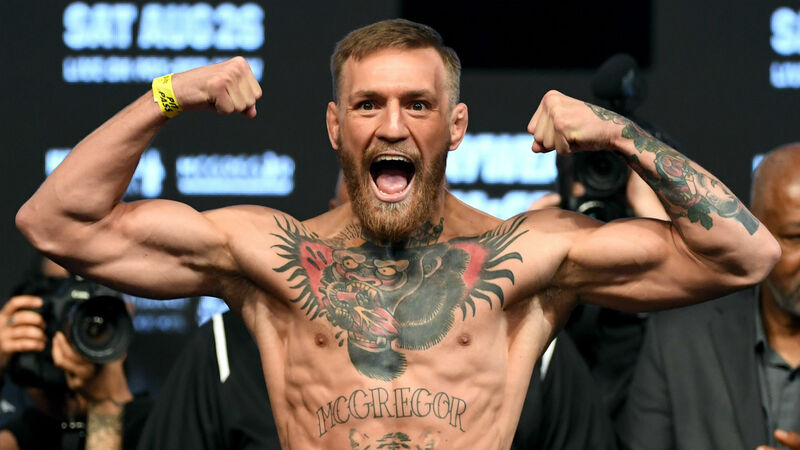 When Conor McGregor appeared on “Ariel Helwani’s MMA Show” three weeks ago, the former featherweight and lightweight champion stated he would one day like to take on Anderson Silva. Fight fans were indifferent to the idea since the former was about to battle Khabib Nurmagomedov at UFC 229. Silva immediately came out and said he was interested, as well. Now, the former longtime middleweight kingpin and part-time light heavyweight is back at it stating he wants the clash to happen after he gets off his one-year suspension for failing a drug test last October at a catchweight of 180 pounds. The big problem with the idea is the little matter of McGregor only fighting two times welterweight: at UFC 196 and UFC 202 with Nate Diaz when he weighed in at 168 pounds for both contests. There’s no way the fight will happen. After re-hydrating, Silva would come in at around 200 pounds and would have at minimum a 25-pound advantage. Silva’s called the fantasy matchup a “martial arts challenge.” All it would be is a clown show. McGregor’s made it clear that he’s no longer interested in being part of a circus like the Floyd Mayweather fight. The 43-year-old knows how bad he would hurt McGregor and is looking for one more massive payday before retirement. Regardless of age, a smaller man fighting a much larger man never ends well and it would be the same in this instance. Time to pump the brakes on Mayweather vs. Khabib talk. Since he submitted Conor McGregor at UFC 229 to retain his lightweight title, Khabib Nurmagomedov has become a worldwide superstar. But the spotlight shined brighter when he appeared in a video with the head of Mayweather Promotions, Leonard Ellerbe, and challenged Mayweather to a boxing match. The boxing great quickly accepted and off to the races the story went. Both fighters and their camps have repeatedly stated their desire to do this. Thankfully, UFC president Dana White put out the flames, saying it will never happen. Couldn’t agree more with those words. We have already seen the MMA fighter go into boxing when McGregor and Mayweather “boxed” in August 2017. The entire buildup was a circus and the fight, while entertaining, was nothing more than a spectacle. Nurmagomedov and Mayweather are basing a far-reaching dream fight because of one, wild, looping right hand, which, yes, caught McGregor clean, but it would NEVER happen again if McGregor actually respected the lackluster striking game of the undefeated MMA champion. Nurmagomedov’s striking is beginner level, at best. Facing Mayweather would be more of a laughing stock than we saw last August and talk needs to end ASAP. The longer it continues, the more of a joke it becomes. On one hand, you can see where Jones is coming from based on what he’s done in the sport. He’s regarded by many as the greatest to ever step inside the cage and has beaten every one who came towards his pursuit of greatness. Performance-enhancing drugs are performance-enhancing drugs anyway you slice it. Doesn’t matter if you knew they were in your body or not. Everything would have been easier if Jones would have just said he took steroids, this is why I took them, and moved on. We live in a forgiving society where people offer athletes second chances. Instead, it’s one denial after another from Jones. The more the 31-year-old does it, the worse he comes off. You want to like Jones. He’s charming, a good personality and he can flat out fight like no other. Whether it’s just being too stubborn, having a mental block in his head or is hanging around people who tell him what he needs to hear, Jones needs to start being honest to everybody. The moment this happens is the day where the public will once again embrace Jonathan Jones.